After Perihelion (which would be a good name for a band), the Rosetta team continues to release new studies of 67P/CG. To date, most of the analysis is based on data from the first months in orbit, the perihelion will come out later (probably in time for big meetings in December and January). 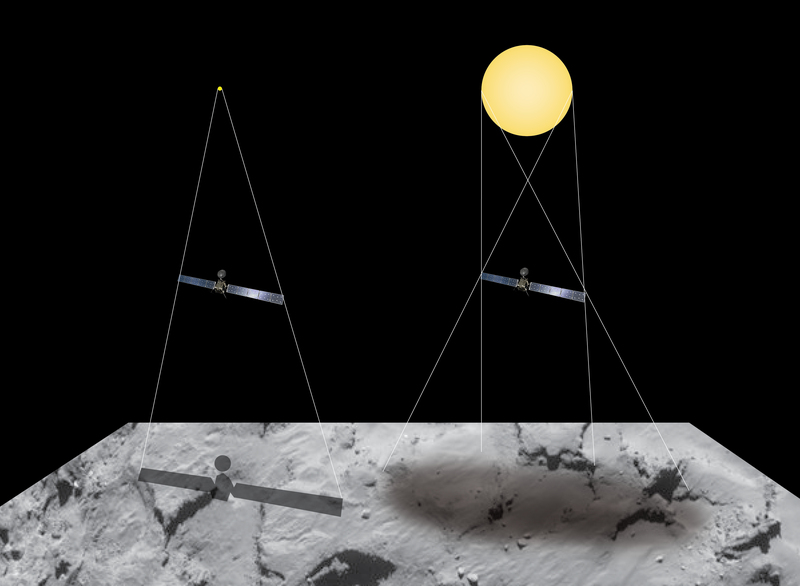 One study examined fissuring on the surface of the comet, published in Geophysical Research Letters. 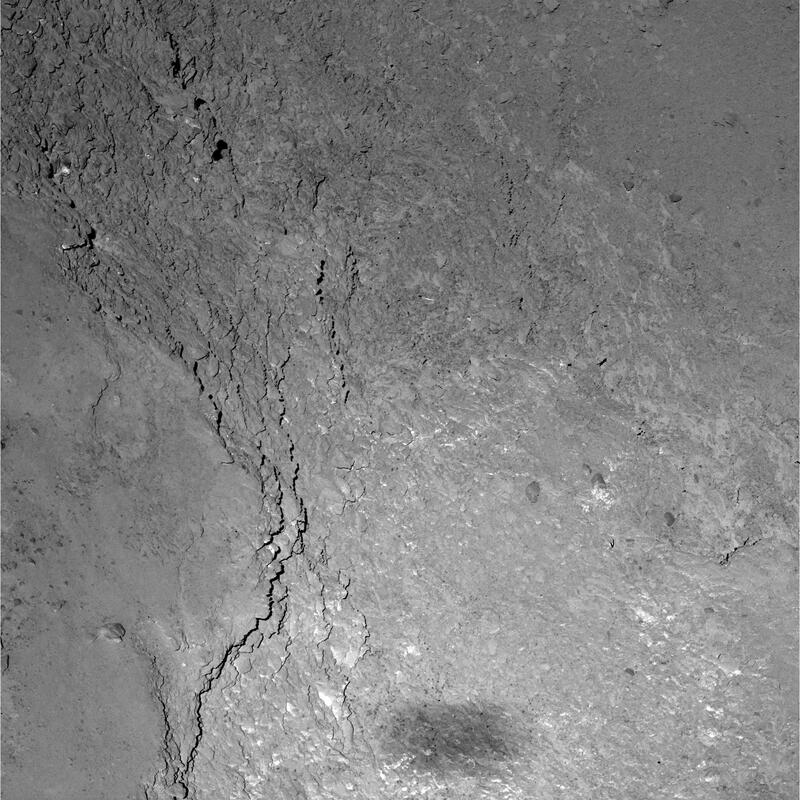 Now that we have close up views, we can see many different fissures and cracks in the surface, which gives us basis for inferring some of the erosion that occurs on the comet. Of course, it will be really interesting to compare the “before” images to similar images collected after perihelion, which should show many changes which will tell us what happened. 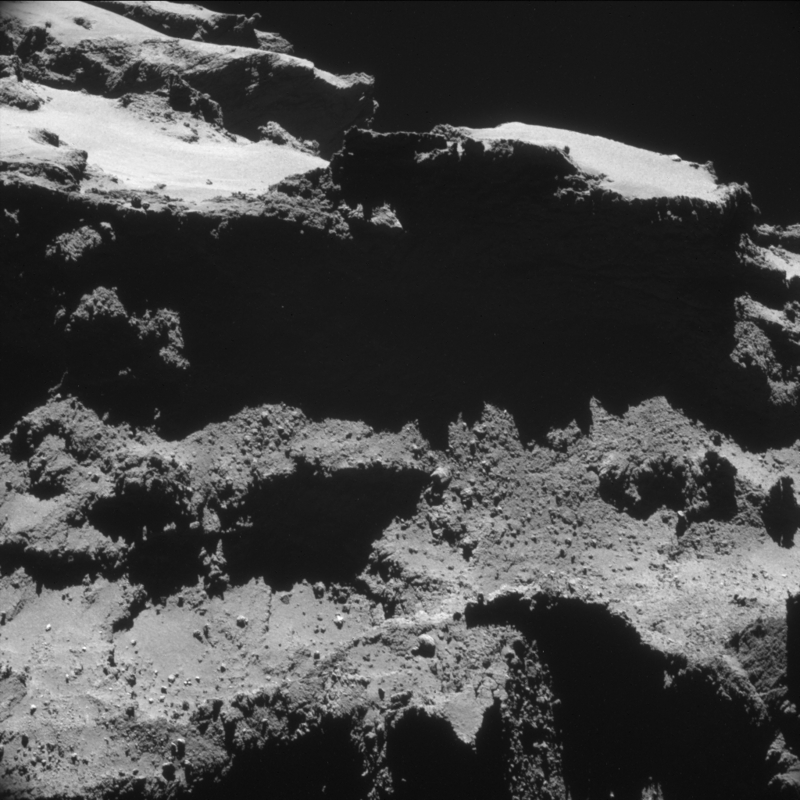 The Rosetta team also has examined the magnetic fluctuations, dubbed “singing”, observed last year. These waves are different from what has been observed in other comets, and the team theorizes that they are due to the behavior of the plasma field at the time when 67P/CG was still cold and the plasma cloud small. 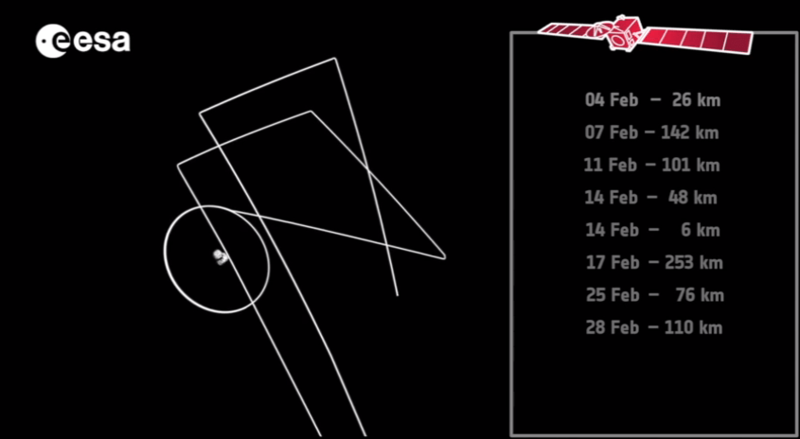 The observations show the unexpected “singing” abated around February, as the comet came closer to the sun. In the near future we should have observations from perihelion, which may well show the development of the “song” like those observed in other comets. Meanwhile, the Dawn spacecraft is comfortably orbiting Ceres at its final altitude of 1470 km. Each 11 days, Dawn completes a map of the surface of Ceres at three times the resolution of any previous imaging. This spacecraft is an awesome piece of engineering to last this long and collect so much data. OK, Ceres looks kind of like the moon, all grey and cratered. But now we have really, really detailed maps and, with multiple overflights, 3D reconstructions. A BBC report reminded me that the Cassini spacecraft is Still Out at Saturn (yet another good name for a band). Cassini launched in 1997(! ), and has been touring the neighborhood of Saturn, observing the planet, rings, and many moons, and dropping the Huygens lander onto the surface (or at least methane lakes) of Titan. Awesome! The probe is now preparing for its last loop away from Saturn before a final funeral plunge into Saturn in 2017. 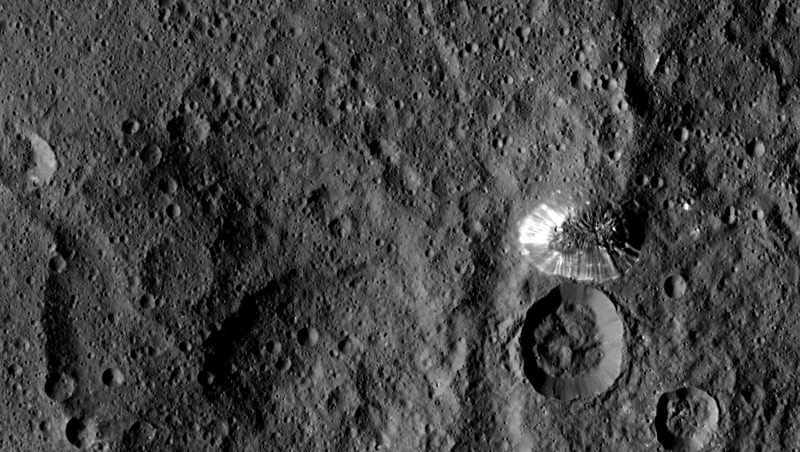 What Are The Sparkly Spots On Ceres? 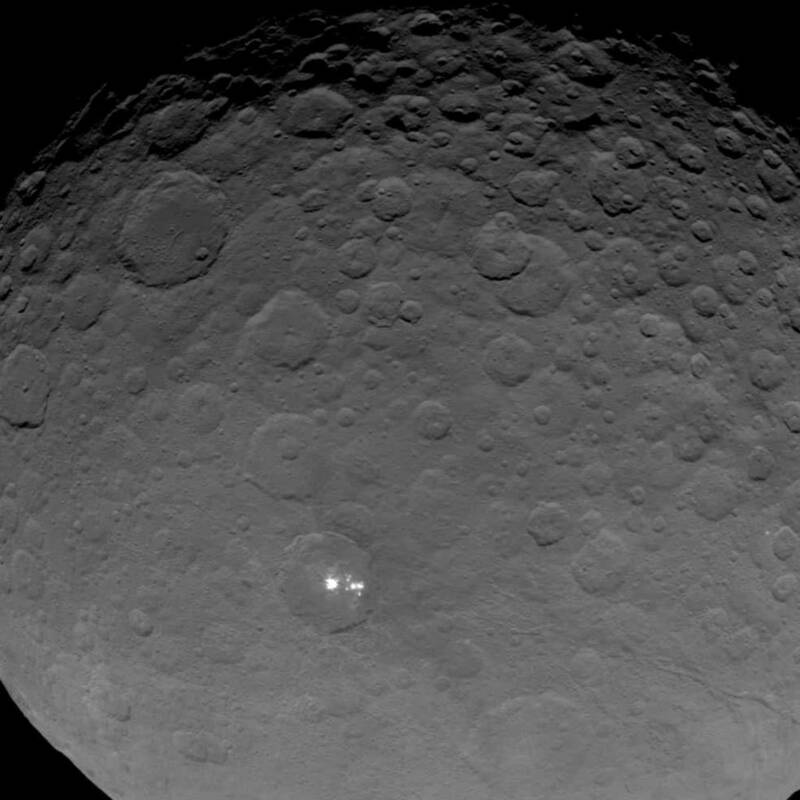 The “Dawn” spacecraft has finished downloading the navigation images, and has now begun systematic imaging of Ceres from a circular 13,500 KM polar orbit. These images were captured a week ago—it takes a while to transmit them back, and to process the data. A reminder of the magnitude of the enterprise: this is pretty far away from home. The fact that the software is still working after years untended is amazing. So far, Ceres is not an especially photogenic destination. The main point of interest so far are the mysterious “bright spots”, visible in this week’s images. It isn’t known what they are, so we’ll all be looking to the upcoming observations for more clues. Speaking of huge undertakings, we commenmorating the 25th anniversary of the Hubble Space Telescope. Though now superceded by technical advances, this has been one of the most significant scientific instruments ever. And, by the way, there are gazoogabytes of data from Hubble available for anyone who wants it. E.g., start with the Hubble Legacy Archive. (Astronomers are some of the original and most consistent practitioners of true Open Data policies.